This second Extra Detail Magnification (or "EDM", for short), obtained fromthe APOD of June, 5, 2016, shows us that, just like a Cosmic Lava Lamp, a large section of Pluto's Icy Surface is being constantly renewed by a process called "Convection": a (basically, but NOT only!) Geological "situation" which allows, thanks to the specific (---> peculiar) conditions of a given environment, the replacement of older Surface Ices with fresher Material. 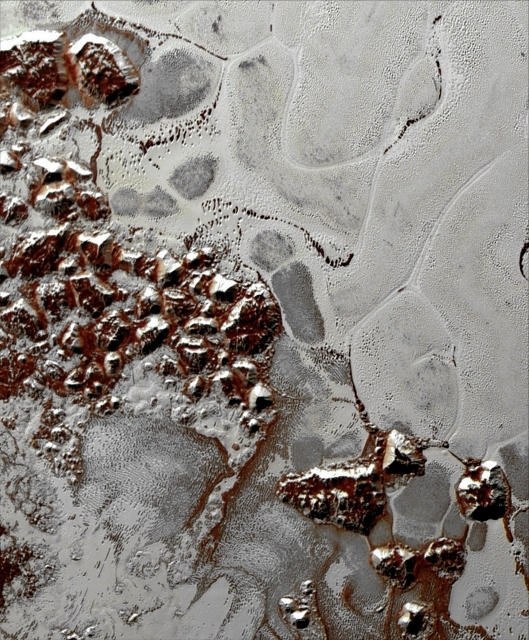 Planetary Scientists from NASA's New Horizons Mission used state-of-the-art computer simulations to show that the Surface of a Region of Pluto's, so far informally named Sputnik Planum, is covered with churning (---> turbulent) "Ice Cells" that are geologically young and turning over due to the abovementioned process. The Full Original Scene used data obtained from the New Horizons Ralph/Multispectral Visible Imaging Camera (or "MVIC", for short), that were gathered on July 14, 2015. Their findings are published in the June 2, 2016, issue of the journal Nature. Last, but not least, the "reddish" color of a few areas of the Plutonian Surface visible in this EDM, could be the result of the extremely long action (---> we mean billions of years) of Cosmic Rays and Solar Radiations; also to be noticed is the presence of a Cluster (that really looks like a like a "Chaotic Sub-Region") of relatively small and "squared" Hills, Blocks, and unusually-looking Mountains which are - once again, for still unknown reasons - dark-red/orange colored and totally (or almost totally) Ice-free. The image (which is a crop obtained from an Original NASA - New Horizons Spacecraft's Approx. Natural Colors and NON Map-Projected Image-Mosaic published on the NASA - Planetary Photojournal with the ID n. 20726) has been additionally processed, magnified in order to better see the details, contrast enhanced and sharpened, Gamma corrected and then colorized (according to an educated guess - or an informed speculation, if you wish - carried out by Dr Paolo C. Fienga-LXTT-IPF) in Absolute Natural Colors (such as the colors that a normal human eye would actually perceive if someone were onboard the NASA - New Horizons Spacecraft and then looked outside, towards the Surface of the Dwarf-Planet Pluto), by using an original technique created - and, in time, dramatically improved - by the Lunar Explorer Italia Team.